Random House Trade Paperbacks, 9780812973211, 256pp. What does it take to be happy? How happy is happy enough? And what does “happy” mean, anyway? 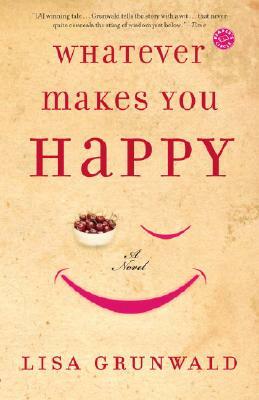 So asks Sally Farber–wife, mother, daughter, friend, working woman, and lover–in this wise and funny novel about a woman’s search for happiness in some of the right, and a few of the wrong, places. Summer in the city looms long for Sally Farber when she sends her two daughters off to camp for the first time. Suddenly freed of her usual patterns in a city that becomes a grown-up’s playground,, she embarks on a journey unlike any she’s ever had–filled with guilty pleasures and guilty pains. Caught between the past (cleaning out her childhood apartment as her demanding mother offers edicts from South Carolina) and the future (facing her first semi-empty nest), Sally finds herself unexpectedly involved with a powerful, unpredictable man. And as she researches a book whose very topic is happiness, she must weigh the relative merits of prescriptions for its attainment offered by Aristotle and the Dalai Lama, Freud and Charles Schulz, scented candles and Zoloft, her mother and her best friend. The answer comes, in the end, from a surprising discovery, in this rich and original novel about how we can find, and ultimately embrace, both happiness and love. Lisa Grunwald is the author of the novels New Year’s Eve, The Theory of Everything, and Summer. Along with her husband, Stephen Adler, she edited the anthologies Letters of the Century and the forthcoming Women’s Letters. Grunwald is a former contributing editor of Life and a former features editor of Esquire. She and her husband live in New York City with their son and daughter. "A snappy, pleasant novel content with its own wit." "Sally's quest for personal fulfillment allows Grunwald to muse on the roots of happiness, mining sources as diverse as Aristotle and Charles Schulz to present a porvocative array of answers. Whatever Makes You Happy is a satisfying portrait of upper-middle-class angst. But it is also the tale of a woman's pursuit of a life philosophy--and through that search, readers may discover stepping stones for their own."